World food supplies and jobs are at risk unless urgent action is taken to stop global declines of pollinators, leading scientists have warned. 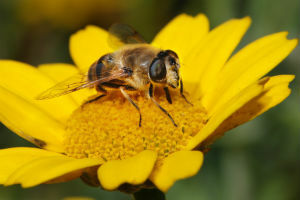 The authors of a landmark United Nations report on pollinator decline - including from the University of Reading, University of East Anglia and Centre for Ecology and Hydrology in the UK - blame loss of habitat, climate change and farming changes for the falls. Building ‘bee highways', reducing so-called green deserts, and helping farmers work with nature could all help, the researchers say in a new report. Working with nature: Farmers should be encouraged to protect and manage wildlife that underpins crop production (ecological intensification). This would enhance natural processes, such as pollination and pest control, and reduce reliance on pesticides. Mixing up monocultures: Policies should be introduced to cut down on ‘green deserts' - landscapes dominated by a single crop species - in favour of more diverse farming systems. Pollinator-friendly practices include mixed cropping and livestock farming, and creating flowering habitat patches. ‘Bee highways': Pollinators need a network of habitats for food and shelter, linked together to allow them to move across landscapes. An ‘ecological infrastructure' plan would create a patchwork of habitats, joined with corridor schemes, such as ‘bee highways'. Simon Potts, Professor of Ecosystem Services at the University of Reading, co-chair of the UN's report into pollinator decline, and is lead author of the latest Nature review. He said: "We conducted the most thorough review of the science ever undertaken, sifting through all the available evidence, to provide governments with the best and latest evidence on pollinator decline. "The UN report is a good start, but now we need action. We need governments, farmers, industry and the public around the world to act to stop further declines in bees and other pollinating animals. "It's not all bad news for bees, and luckily we still have options to help. Doing nothing is a big risk that could endanger the global supply of nutritious foods and the livelihoods of millions of people." The latest report highlights how safety procedures for new pesticides and GM crops could be tightened to take into account risks to wild insects, responsible for most insect pollination. Currently, regulators only require manufacturers to assess risks to honeybees, and not wild bee species. The scientists also suggest tighter regulation of movements of managed honeybees, to reduce the spread of troublesome pests and diseases that can quickly destroy colonies. Habitat loss, pesticides, GM crops, diseases, invasive species, and climate change are all implicated. Professor Potts will next month take the scientists' conclusions back to the UN for discussion. Countries are due to meet in December in Cancun, Mexico, for conservation talks organised by the UN's Conference of the Parties (COP) to the Convention on Biological Diversity, with pollinator decline high on the agenda. Today's new report follows an article in Science published on Friday last week, in which the same group of scientists suggested more policies to help pollinators.